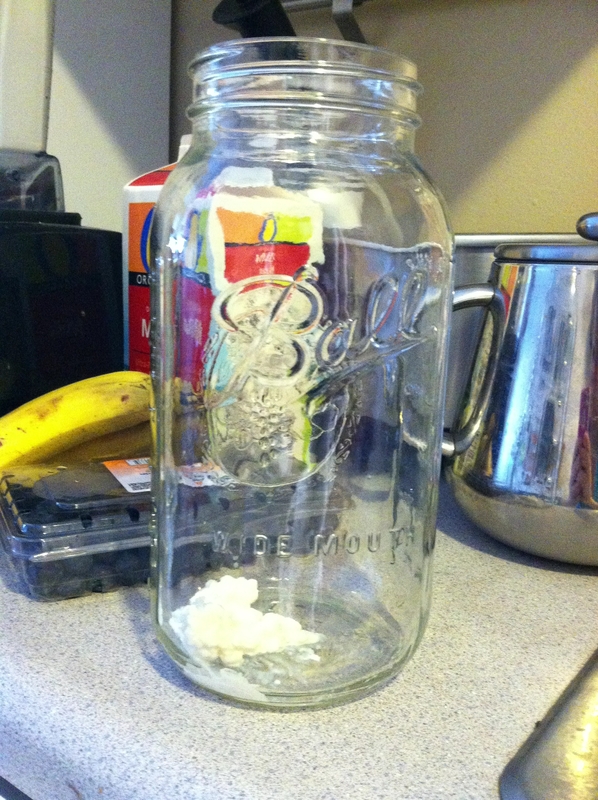 I have been making homemade dairy kefir for two years. I’m still working, essentially, with the first culture I got–talk about a persistent little colony! I share the grains with clients and friends frequently, so I thought it would be easier to do a little instructional blog post than to keep repeating myself. Milk kefir is a good first probiotic food to make on your own for two reasons: it’s the easiest method I’ve discovered yet, and it has the added benefit of making a healthy protein-rich breakfast that is so important in pregnancy. If you have a true dairy allergy/sensitivity I probably wouldn’t recommend it (unless your sensitivity is mild), but if you are lactose intolerant there’s a good chance you’ll be fine with this because the bacteria/yeasts consume the lactose in the milk. I believe fermented and cultured foods are incredibly important to maintaining a healthy gut flora. I could research this statement and reference this post, but I’m not going to do that. Do the digging–you’ll be amazed at what you find. I suspect, and am informally conducting an observational “study” that women who do homemade probiotic/fermented foods culture negative for GBS more often than in the general population. I also suspect that store bought probiotics are not as effective. So, you’ll need to acquire a live culture from someone who has one–if you’re local, I’m happy to share. You can purchase freeze dried grains and bring them back to life, but I can’t attest to their longevity. I also don’t think the store-bought product that you buy at health food stores is the same thing, as it has to keep being replenished over time. First thing is to gather your supplies and ingredients: a large jar (I love my 1/2 gallon Ball jar because I make 4-5 cups/day), something to cover it with, a small plastic colander, a rubber spatula or plastic spoon to shift the kefir into the colander, and ingredients for the kefir itself. NOTE: It is important to use only plastic supplies as the kefir will react unfavorably to metal. I use organic whole milk from the grocery store. I have used raw milk before, and the kefir *loves* it, but I’m not currently in a raw milk co-op. I strain my kefir into the Vitamix blender every morning and have found the best recipe for our family–who is fairly persnickety–is: 4-5 C kefir, 2 bananas, 8oz of either frozen cherries or frozen blueberries, 1/2 dropperful of stevia. Cherries are, in my opinion, better, but blueberries are cheaper and easier to find usually. You can make your smoothies however you want, though! I have experimented with 80,000 variations, and for us this works because 1) the bananas add the necessary sweetness (along with a little stevia) and 2) the blueberries or cherries provide all those amazing antioxidants. But whenever I go crazy and add greens or anything too adventurous, they won’t drink it, which completely defeats the purpose. NOTE: You can strain your kefir after it’s cultured for 24-hours into another jar and put that jar into the fridge for a second fermentation. This leads to a bubblier and colder kefir–it really tastes a bit better (and probably is a little more dense in probiotics because it got a second fermentation), but for us the simplicity of omitting this step is worth it. The culture itself, looks a bit like cottage cheese, but most of it is all connected in a big, flat, colony. Little colonies will break off and start out on their own, and these are usually the ones I share. But from time to time I’ll just pull a chunk off the big colony, and that works too. 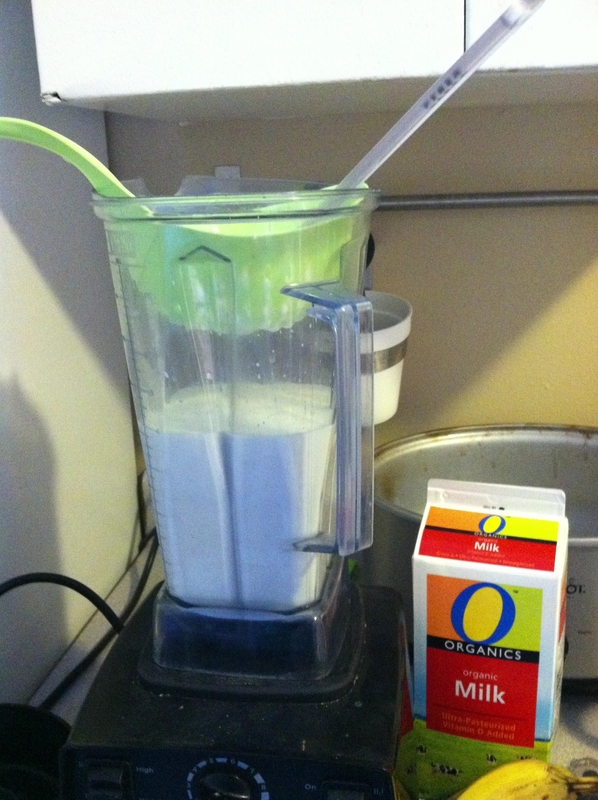 Blend up the smoothie ingredients and then add new milk to the culture in the jar. Cover the jar loosely–either with a canning jar lid (just not screwed tight) or cover with a bowl or something like we do (don’t tighten it down because it produces gas and could cause a container to explode). Let the new batch ferment on your countertop for about 24 hours. That’s it. NOTE: The ratio is about 1 teaspoon (ish) kefir grains to 1 cup of milk, but that may vary for individuals due to the culture itself or temperature. The finished kefir should smell like sour, unsweetened yogurt. 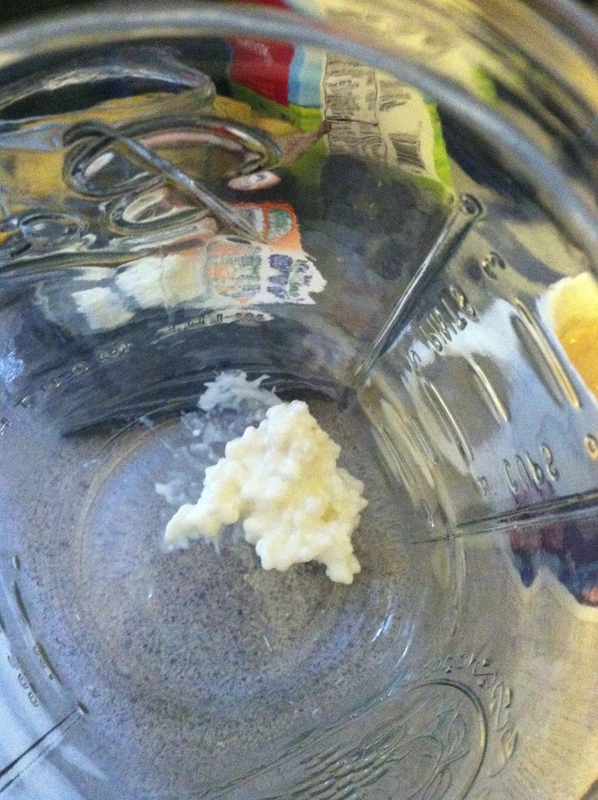 If it smells like ammonia, drain off the kefir and discard and start a new batch. If it doesn’t smell sour and is thin like milk, it needs longer to ferment. If your kefir starts separating into a very thick white product and a watery product (curds and whey essentially) it’s either over-culturing or you have more grains in proportion to milk that you need. It’s okay to strain all this into the blender and drink it as is, but then either take out some grains or add some milk to your next batch. I have heard you can use goat’s milk, but I’ve never tried it. Let me know if it works for you! If you need to go on vacation or are just sick of kefir and need a break, you can put the jar of already-cultured kefir in the fridge and leave in there for up to 2 weeks (or maybe longer–just use the smell test). 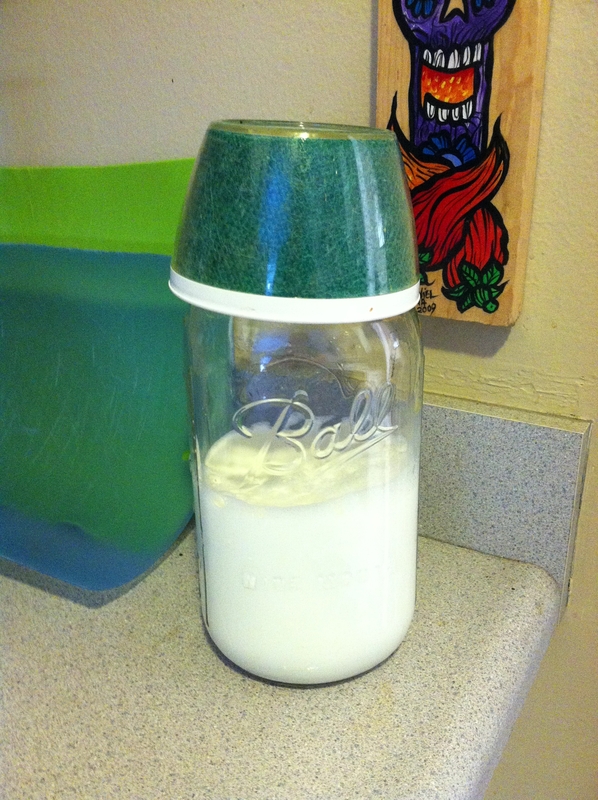 You can also store separated kefir (without the grains in it) in the fridge for about 2 weeks. There are also lots of recipes for dealing with excessive kefir, such as kefir bread (tastes like sourdough) to help you deal with any over-production you have. Stay tuned…there’s a water kefir tutorial coming soon!